Garbage disposals can oftentimes be your best friend when it comes to doing dishes. 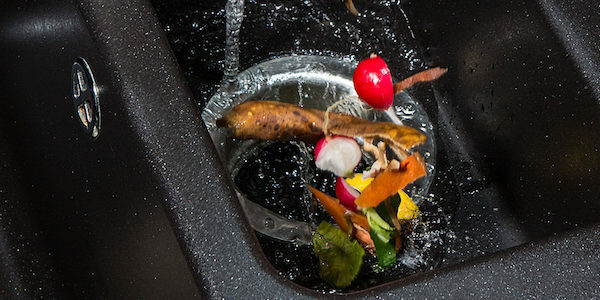 Getting rid of nasty leftovers that have been caught in the sink, a garbage disposal can be a great convenience for any kitchen. However, it is important to understand what you can and cannot dispose of when it comes to your garbage disposal. Here are some tips to keep your disposal running smooth over time, including what you can and can’t properly dispose of. Start by turning the water in your sink on to run cold water. Cold water is preferred when using a garbage disposal because it keeps any oils from breaking down a little better than hot water. Turn the garbage disposal on. Don’t place food in the disposal before turning the garbage disposal on. Gradually feed food into the garbage disposal, making sure not to overfill the unit. When you’ve finished putting food through your disposal, turn off the disposal, but allow your cold water to keep running for about 5-10 seconds after shutting off the water to flush the broken up food particles down your drain. What Can I Put in The Disposal? Meat: If you have any meat that is considered waste, it is soft enough for the garbage disposal to do its work and dispose of it. Make sure the bones are removed if possible. Fruits and veggies: These are some of the safest bets to dispose of, as they are soft enough to be grinded up into small chunks without any risk of breaking your disposal. The exception to this is celery, which is stringy and should be avoided if possible. What Shouldn’t I Put in The Disposal? Bones: Any kind of bone can cause clogging and stop the blades from working. It is best to dispose of the bones in the garbage than the disposal. Coffee grounds: This one has caused misconception for a while, but there is a truth in the matter. While coffee can be disposed of easily, it can build up over time and cause your blades to stop working. Not worth the headache. Grease: Whatever you do, make sure you don’t put grease into the disposal. Though it will pass through the blade, it will clog your pipes up in time and cause some hefty repairs to be done. Egg Shells: Some people believe eggshells are ok to put down a garbage disposal. Those people have likely not had to repair a garbage disposal before. Egg shells’ membranes can wrap around the blades over time and cause a malfunction. Non-food Products If the item you’re considering putting down isn’t food, don’t put it through your garbage disposal. This includes sponges, cans, dirt, hair, or bathroom waste. What Should I Do to Maintenance My Disposal? Buildup happens over time, and it can create some unpleasant smells for your disposal. Every so often, run cool water and ice cubes down the drain, along with chopped citrus peels (like from a lemon, orange or lime) for about 60 seconds. This will help push any disposed of items further down the drain and remove any particles left over near the blade that have built up over time, as well as make the disposal smell better. Be sure to remove the plastic cover from the drain and use a steel wool pad to scrub around the rim and inner upper area of the disposal. Make sure the disposal is off and unplugged before doing cleaning, even if you’re not coming in close contact with the blades. What Should You Never Do When Cleaning or Maintaining Your Disposal? The disposal has some pretty sharp blades inside of it. Never, ever place your hand down there while the disposal is running. If you receive something like a fork, spoon, or small glass down the drain, always ensure that the disposal is turned off, unplugged, or the breaker is turned off via switch before attempting to dislodge any stuck items. Never place your hands down a garbage disposal regardless, and use pliers to remove any objects. Ultimately, if repairs are necessary it is important to contact a professional first before risking your safety. Call Greenwave Plumbing today with any garbage disposal concerns. PreviousPrevious post:How to Prevent Toilet StoppagesNextNext post:What’s the Difference Between a Conventional Water Heater and Tankless Water Heater?